I think I have the answer on why my corn has no ears and why I am seeing flowers pop up way away from where I planted them. I don’t know why I didn’t think of this reason sooner. There really can be just one answer: Garden fairies. On my way home from work this evening, I caught the better part of an interview on the radio with someone in Ann Arbor, Michigan, discussing all the urban fairies in that area. That’s where I got the idea that garden fairies might be behind the mysterious happenings in my garden. Yes, that’s right, garden fairies. Hear me out on this. They would certainly be able to move seeds from one place to another. And, they may be playing in the corn at night, climbing up and down the stalks, removing the ears in the process. More evidence may be lurking in the green beans, where I am seeing one or two beans with the tips bitten off. Fairies have to eat, too, right? And how else do you account for the sudden appearance this evening of a zucchini squash nearly a foot long. I checked those plants myself just yesterday for squash to pick and I tell you, there was certainly nothing nearly that size yesterday! I think the fairies arranged the leaves to hide it from me, and then today watched me from under some nearby shrubs so when I found it, they could have a good, hearty laugh at my expense. How else would you explain it? And yesterday morning, while weeding in the garden, I misplaced a pair of gardening gloves. Or did someone take them while I wasn't looking? I have been told, and have told others, that the spots on the inside of foxglove flowers are the footprints of garden fairies. I never quite believed it, but now I don’t know what to think. I really can think of no other explanations for these events in my garden. 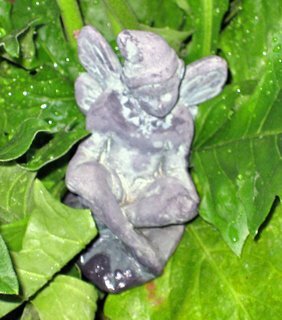 Anyone have any experience with garden fairies or know how to determine if you have them in your garden? Yes ... "faeries at the bottom of the garden" are a long-standing tradition here in the UK, and although almost nobody admits to believing in them any more I have noticed that things sometimes disappear or get moved around. Sometimes I get prodded in the back while I'm bending over in the garden ... I expect they have a great laugh watching me leap up in the air with a "whatwasthat?!" I hate to be the one to tell you...there are no such thing as garden fairies..just bunnies, bunnies, and more bunnies!!! You think a bunny ran off with my gloves, too?! No, twas the fairies! Garden Fairies??? Or have you been in the sun too long? Just don't let them in your house. You will have chaos all winter and when spring comes and it is time to go outside, they will hide in your houseplants and NEVER leave! !